As promised I have enclosed my tasting notes for the wines I sampled at the three International Cool Climate Chardonnay Celebration seminars. Many of these Chardonnay come from Ontario, but there are also wines from BC, California, Chile, France and more. My notes are not as detailed as notes I make from my structured tastings at home, but should give you a good idea of each wine’s aromas, flavours, and my 5 star rating. Wine 1: Lightfoot & Wolfville Vineyards 2014 Ancienne Chardonnay, Nova Scotia – Bright lemon. Very aromatic; tropical fruit and vanilla nose. Medium minus body, dry and round, and rich mouth feel. Tropical fruit and oak on the palate, along with some pepperiness. Tart citrus finish with a medium length. Wine 2: Malivoire 2014 Mottiar Vineyard Chardonnay, Niagara – Light straw colour. Light, stony, melon nose. Lighter body. Dry with flavours of crisp apple and a hint of stone fruit. Not quite round on the palate. Hint of lees. Wine 3: Eszterházy 2015 Chardonnay Leithaberg, Austria – Medium lemon coloured. Smoky with a lighter tropical fruit nose. Medium minus body with light mouth feel; not overly round. Citrus with a hint of mineral and light pepperiness on the end. Wine 5: Manoir de Mercey 2015 Bourgogne Hautes Côtes de Beaune ‘Clos des Dames’, Burgundy, France – Bright lemon with a green tinge in the glass. Very light nose; oak and tropical fruit. Medium minus body, round with light mouth feel. Light flavours and sweet spices. Wine 7: Cremaschi Furlotti 2015 Single Vineyard Chardonnay, Chile – Medium minus lemon colour. Light citrus and apple aromas. Medium body, dry and soft with some minerality. Light melon and tropical fruit flavours, along with light sweet spices and vanilla on the finish. Wine 8: Bachelder 2013 Chardonnay Johnson Vineyard, Oregon – Bright lemon colour. Light honey and ripe stone fruit nose. Medium plus body, round with oxidized apple aroma, along with light sweet spice and oak. Good wine. Wine 9: Southbrook 2013 Poetica Chardonnay, Niagara – Very deep gold in colour. Aged tropical fruit and vanilla aromas. Medium plus body, round, with flavours of apples and stone fruits. Medium oak and vanilla flavours as well. Buttery. Tasty. I Do It My Way Chardonnay wine flight. Wine 1: JoieFarm Un-Oaked Chardonnay 2016 – Medium minus lemon. Quite aromatic with aromas of ripe apples. Dry with medium plus acidity and an acidic prickle on the tongue. Angular. Tart crab apple flavour. Wine 2: Trail Estate Winery Chardonnay Unfiltered 2015 – Deeper lemon colour. Very oaky nose, plus smoke and tropical fruit. Full body, round with lots of oak flavour. Also you get tropical fruit and vanilla, with some spice on the finish. Wine 3: Norman Hardie County Chardonnay 2014 – Deep lemon colour. Heavy nose with aromas of ripe apples and pears. Fuller body, with higher acidity. Round mouth feel. Flavours of apples and spice, with tropical fruits on the finish. Wine 4: Domaine Laroche Chablis 1er Cru Les Vaudevey 2014 – Medium bright lemon colour. Restrained nose with aromas of citrus, melon and a hint of jalapeno pepper. Full body, dry with some roundness. Melon and some tart green fruit on the palate. Some oak toward the finish. A hint of minerality. Wine 5:Invivo Gisborne Chardonnay 2016 – Deep, bright lemon colour. Nice nose; light oak, green peas and melon, followed by tropical fruit and stone fruit. Medium body, dry, soft and round mouth feel. Light oak, lees, apples, melons, pears and sweet spices. Also some pepperiness. Nice. Wine 6: Scribe Skin Fermented Chardonnay 2015 – Deep bright lemon colour. Medium intensity nose of honeyed stone fruit. Fuller bodied with aromas of flowers, stone fruit, bruised apple and a touch of oak. Strong minerality. Quality. Wine 7: Pearl-Morissette Chardonnay Cuvée Dix-Neuvième 2014 – Medium plus lemon colour. Some VA on the nose gives a sort of meaty smell to the wine, along with apples. Medium plus body, round and dry. Deep tropical fruit flavour, caramel and medium intensity oak and vanilla on the finish. Wine 5: Sperling Vineyards 2013 Blanc de Blancs Brut Nature, Okanagan Valley, BC – Pale lemon in the glass. Flinty, petrol, lemon nose. Medium mouth feel, very tart, with small creamy bubbles. Wine 6: Champagne Drappier N/V Blanc de Blancs, Champagne, France – Pale pear skin colour. Oxidized apples on the nose. Off-dry with small bubble and apple flavour. Wine 7: Château des Charmes 2014 Blanc de Blancs Sparkling, St. David’s Bench, Niagara, ON – Medium lemon + pear skin colour. Bruised apples on the nose. Off-dry, with a fino sherry flavour, along with bruised apples. Wine 8: Marcel Cabelier 2014 Crémant du Jura Organic, Jura, France – Pale lemon with a light oak nose. Dryish, with very salty minerality. Citrus flavour followed by floral later. 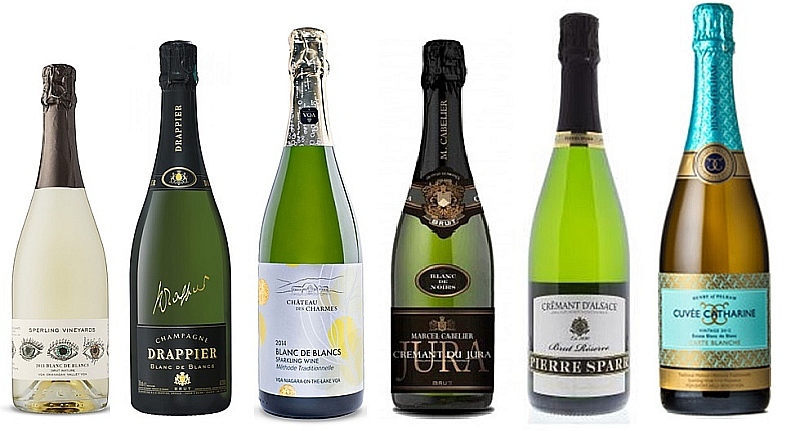 Wine 9: Pierre Sparr NV Crémant d’Alsace Chardonnay Brut, Alsace, France – Medium minus lemon colour. Light toasty nose. Very creamy, fat mouth feel. Wine 10: Henry of Pelham 2012 Blanc de Blancs Carte Blanche, Short Hills Bench, Niagara – Deeper lemon colour with a deep lemon nose as well. Full body with creamy bubble. Medium acidity. Floral component.